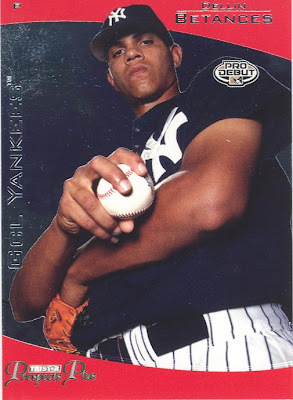 lenNY's Yankees - A Bronx Bombers Blog: 14th Featured Yankee Card of the Week! 14th Featured Yankee Card of the Week! Dellin Betances is one of the youngest and promising pitching prospects for the Yankees. A 21-year-old from Brooklyn, NY, Betances just posted a decent outing in High-A ball in his first start after returning from an injury. I pulled this card in a 2006 TriStar Prospects Plus pack that I bought at a Trenton Thunder game. I always try and see one Thunder game a season when they visit the New Hampshire Fishercats (Blue Jays). Betances is a long ways away, but holds a lot of potential.